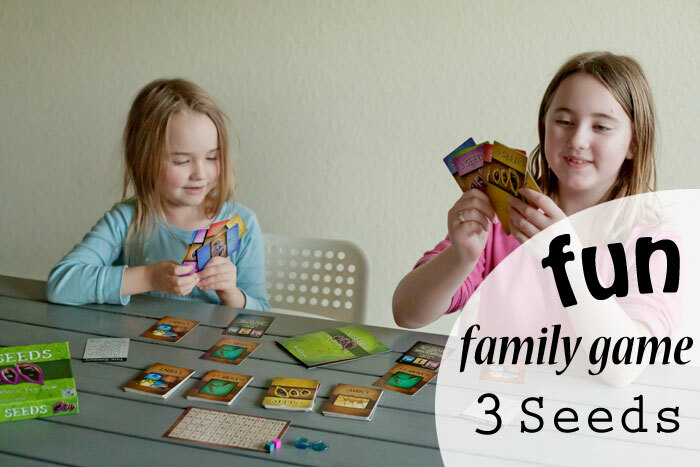 Today’s fun family game is 3 Seeds by Chara Games. 3 Seeds is a light-strategy card game that we were able to learn how to play in a matter of minutes, yet is complex enough to be fun and engaging. It’s completely different than Commissioned, with pretty much the only similarity being that they are both fun family games with a Christian theme. In 3 Seeds, you have seed cards that are divided into time, money and labor. You play these on crop cards and receive a harvest once the crop has received the necessary seeds. You can also play event cards, peek at the hidden value of harvest cards once per turn, or switch your harvest card with another, and play your seed cards on another player’s crop to get some points when it is scored (and get yourself an event card). It sounds pretty simple, but we discovered that there’s a good amount of strategy involved. The game can be played in about half an hour, sometimes a bit more, and is for two to five players. Because it’s a competitive game. not cooperative, Boo can’t really play this one quite yet. The recommended age for it is 12+ but I think many kids 8 and up could have a blast with it, especially if playing with an adult or older sibling. It’s nice that this game is truly enjoyable by just two players. I feel like we don’t really have that many games that are fully enjoyable when you don’t have at least three playing, and Artist really loves it when I play a game with just her.